We went to the Night Bazaar last night on a cycle rickshaw (in which 1 double seat = 1.5 backsides). The night bazaar is huge. We spent about 3 – 4 hours there and probably only made it through 1 eighth of the place. Stalls line the streets for miles and there are also underground shops with people making crafts, etc, in there. Many of them are doing pencil drawings from photographs and they are so lifelike it’s incredible. I’d love to get one done but they’re a bit too pricey for my budget. I ended up with a puppet instead that is a monk carrying an alms bowl. Monks in Thailand walk around each morning with an alms bowl and people put food in their bowls to gain good karma. Every male in Thailand becomes a monk at some stage in their lives, though some only do three months of it. It’s apparently optional as to how long you do your ‘monk training’. Gill ended up with a wooden frog that she didn’t really want, but the hill tribe women walk around selling them and some get so in your face you’re almost swallowing them. Gill caved under the pressure and is now the proud owner of an amphibian. Later on I sat downstairs at our guesthouse (the Family Tribal Guesthouse) and chatted with a Welsh tour guide who’s been in Thailand for about 4 years and also a Thai tour guide from Bangkok, who’s name I can neither remember nor pronounce. The welsh guy used to play rugby in the Hawkes Bay, New Zealand. He’s now a fairly overweight and moaning regularly about the heat. Why you take a job in a hot country then stay when you suffer from the heat I don’t know, but I think he’s the sort that’s happiest when he’s moaning about something. The Thai guy is a lovely cheerfull sort who I was swapping Thai/English 101 lessons with. Later on, we walked around the corner and climbed over a wall to sneak into a nightclub compound. It was literally only a few hundred metres away from home, and I felt very safe with the Thai guy, so if anything went wrong it was very easy to sneak back over the wall and walk home. Also, as Gill keeps reminding me, it’s very safe here with police presence all over the place and they treat the foreign visitors with great respect because we are largely their bread and butter. I was interested to see what a nightclub was like in Chiang Mai, compared to home and I was actually pleasantly surprised. The atmosphere was easy going and I didn’t feel threatened in any way, so it was okay. In this compound, 2 nightclubs faced each other across a yard, one playing Oasis and Nirvana music and the other playing reggae. Many drunk westerners staggered about, spending too much money and imagining they were having a good time, while others danced inside in what equated to a musical sauna. After a while, firesticks and firepoi came out and a good show was put on. About an hour went by and we hopped back over the wall and walked home. This morning I went down to the corner market and chatted with a tailor. Silk (lowest quality) and cotton cost around 100 baht – around about $5 NZ. I spoke with a lovely young girl and she wrote down what market we could go to for buying material. I went to buy a can of Sprite to drink from a little old lady in a wee shop around the corner, and realised that guys were buying glasses of whisky from her, drinking them on the spot, then walking off. No need for a pub around these parts. I then went and bought a bucket to load our waterguns with and walked back home. Turns out that while I was talking inside with the tailor’s daughter, Songkran had begun. I got fired at on the way home, the miscreants including Gill who was doing a Ma Baker act from up on our wonderful streetside balcony – fully armed and a damned fine shot she was. I went up and joined her, squirting passers by, who had no idea where the water was coming from. Just down the road, kids and young western guys from down the ‘Rabbit Hole’ guesthouse were ambushing all who had the misfortune to be walking and driving up and down the street, with a mixture of sophisticated weapons and buckets. 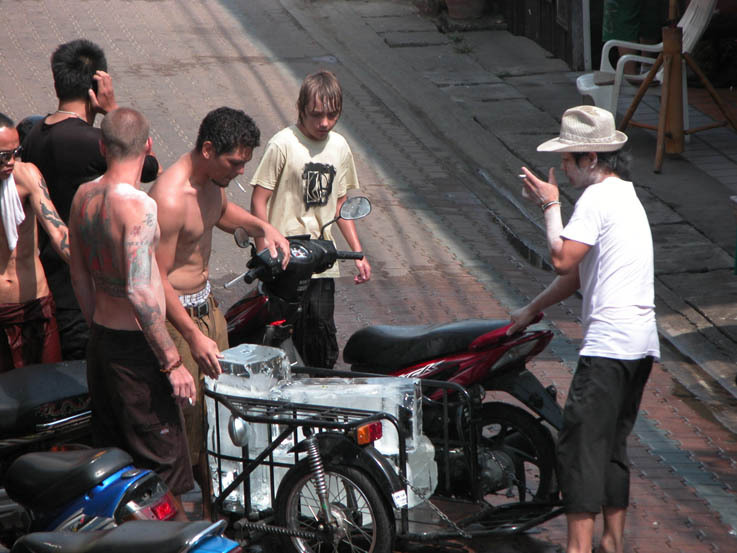 An hour or two later, a guy arrived on a motorbike with a sidecar full of huge blocks of ice, to put in their water supply/ammo dumps. And suddenly, the war had moved up to our building – everyone having sussed out where we were and wanting to get us back for our excellent shooting. 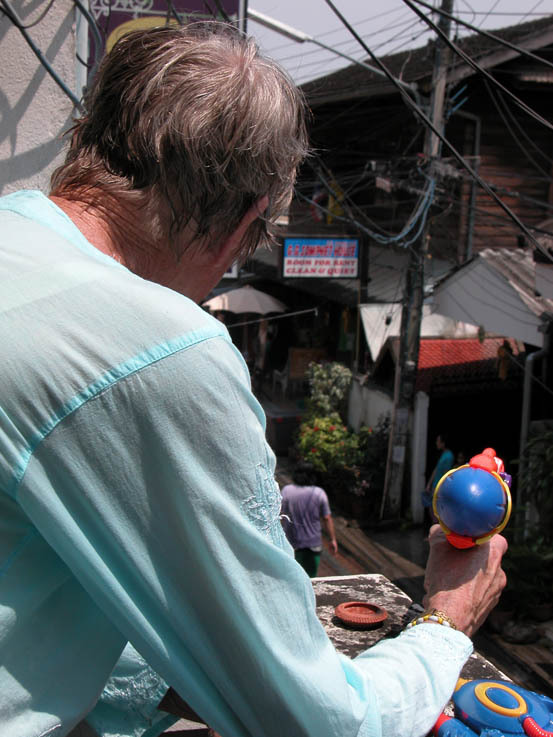 We had guys sneaking up on us from other verandahs, wearing backpacks and pump-action guns, firing at us from behind, and then they moved in with water balloons. The neat thing was, most the balloons didn’t burst, so they were essentially handing us more ammo to use on them. Heh heh. We’ve got the best verandah ever, because it goes around the corner and we have plenty of wall and pillars to hide behind. Heaps of squealing and giggling was going on all over the street and getting soaked was great because it cools you down so much. Finally, just as our trigger fingers were getting sore, a thunderstorm moved in with some nice spectacular lightning and a truce has now been called. Apparently we have another four or five days of this, so we’re going to have to call a strategy meeting and come up with some more cunning plans of revenge. This entry was posted in Ravings - random wafflings, Ravings on Thailand and tagged Bazaar, Chiang Mai, Market, nightclub, police, reggae, silk, Songkran, tailor, Thailand. Bookmark the permalink.